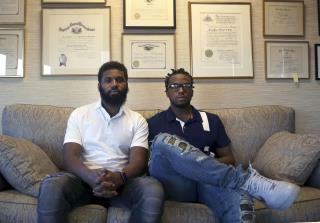 (Newser) – Two black men arrested for sitting at a Philadelphia Starbucks without ordering anything settled with the city Wednesday for a symbolic $1 each and a promise from officials to set up a $200,000 program for young entrepreneurs. And Starbucks agreed to pay for a college education for them, the AP reports. The men and their lawyer said the agreement with the city was an effort to make sure something positive came out of the incident. "We thought long and hard about it, and we feel like this is the best way to see that change that we want to see," said Donte Robinson, one of those arrested. "It's not a right-now thing that's good for right now, but I feel like we will see the true change over time." Later in the day, Starbucks announced it reached a financial settlement with the men. The amount was not disclosed, but the chain said Robinson and Rashon Nelson will be given the opportunity to complete their undergraduate degrees through a Starbucks partnership with Arizona State University. It's just ridiculous that their college educations are completely paid for! They should've just "moved on" and forgotten abt it!!! Those officials shouldn't've done anything for 'em! I believe those blacks were using their "color" as a "commodity" to "take advantage" of the world's "system!!!" I am gonna go to Starbucks and see if I can get free tuition to go back to school! Oh wait it won’t work because I am white! Man,, it's great to be black now. You slip on a banana peel,, the banana's racist. The wind changes too fast east to west,, the wind has racist overtones. In this nation which we've written every law for the past 2/3 century for "all men to be created equal",, we sure do a helluva job creating the circumstance we're not. It's all one way until a particular issue rears it's ugly head,, then "color" somehow becomes a commodity to distinguish just how much a distinction's actually worth. Strange,, isn't it? ?